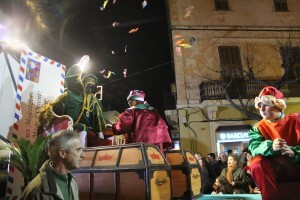 Celebrating the Feast of the Epiphany on the 6th January in Menorca, with The Three Kings delivering the presents! It’s an extra long wait for the kids in Spain, exactly 13 days longer to find out if they have been naughty or nice. Keeping with the religious customs of Christmas, in Spain The Three Kings deliver gifts to the good children now in the same way they did baby Jesus all those years ago. 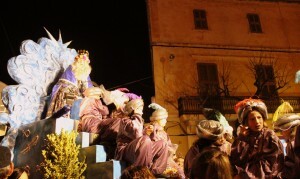 The Three Kings’ role is the same as Santa Claus in other countries. Every December children write letters to the Kings, who are considered magical (Magos), asking for what they want to receive. The letters are collected by a servant of the Kings called the Patge. The night before, the 5th of January parades are held in every town and city where many children and performers participate. Families line the streets to see The Three Kings pass through the town on the way to each house to deliver presents. 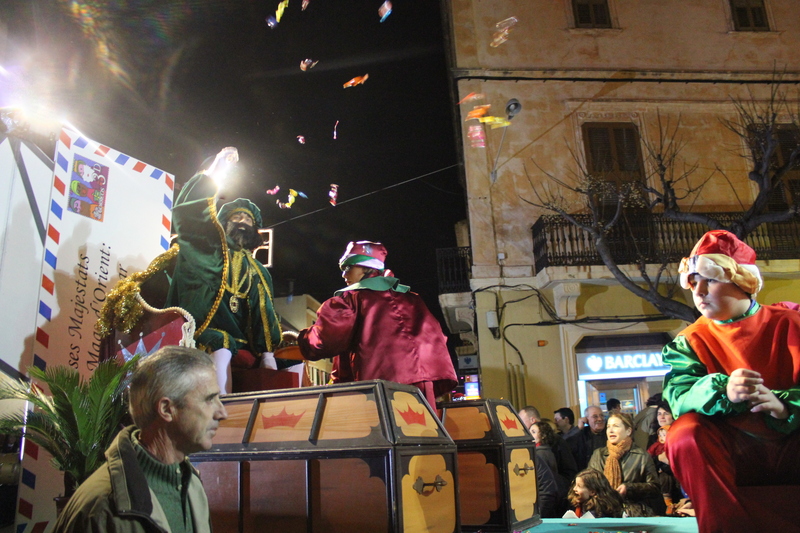 Here in Menorca, The Kings are loaded with sacks of wrapped sweets which they toss into the crowds as the parade continues for all the kids to catch and collect. Each child ends up with a bag full for the efforts! That night or the next morning wrapped gifts for the whole family are left by the Kings somewhere in their home. Instead of getting nothing, the naughty kids are left with a small bag of coal! Every child’s greatest fear! No presents are exchanged by family members as all the presents received are from the Kings themselves. They are a generous bunch for those who are good! Even though this is an old custom that has been maintained through the years, in more recent times children are accustomed to the idea of Santa Claus in movies and Christmas Marketing. It’s not odd to see the tubby, jolly old man in his red suit with reindeer in window displays, and many homes also have a Christmas tree. More popular here is the presence of some sort of Nativity set, called Belén, which are brought out each year in homes, shop windows and churches. Some displays are of spectacular proportions and well worth a visit to see all the detail. The way the religious significance of the celebration is matched so harmoniously with the magic of Christmas for the children is really special. Instead of writing letters and visiting Santa, children write letters to the Kings and make a special visit to go and see the Nativity at their local church. All this comes with that extra two week wait for the greatly anticipated arrival of Gaspar, Melcior and Baltasar who are the Three Kings from the Orient. « For a Prosperous New Year, Peel me a Grape!